Shredded Mild Cheddar Cheese with a Touch of Philadelphia - Flavorful Kraft Shredded Mild Cheddar Cheese with a Touch of Philadelphia has a delectable taste that will elevate your meals from ordinary to extraordinary. Delicious mild cheddar cheese is mixed with Philadelphia cream cheese for a rich and mouth-watering taste you're sure to love. 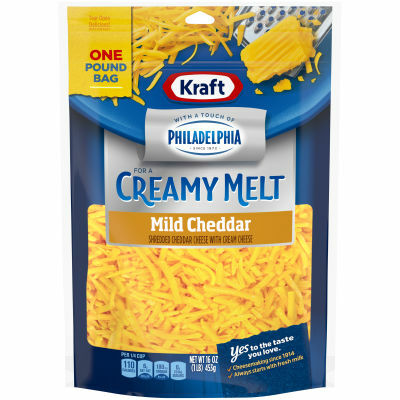 Add Delicious Protein to Your Meal - Full of protein and only 110 calories per serving, Kraft Shredded Mild Cheddar Cheese with a Touch of Philadelphia is a great choice. Try adding this delicious cheese to your favorite tacos, pizza or try it on its own as a flavorful and satisfying snack.